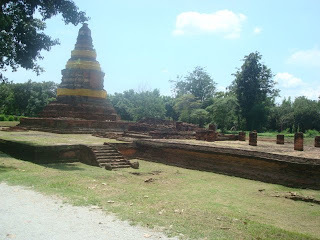 I'm sure many of you have visited the ancient ruins at Ayutthaya and the UNESCO world heritage sites at Sukothai. If you enjoyed the experience then I would like to let you in on a little secret. 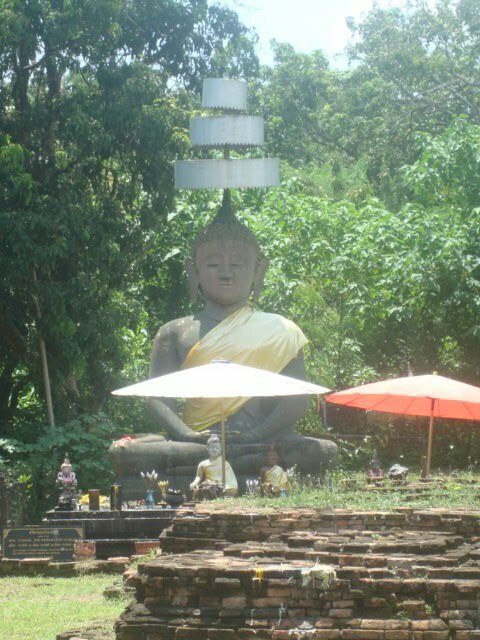 About 5 kilometres South of Chiang Mai, lies a hidden historical gem called Wiang Kum Kam. Whilst it doesn't rival Sukothai or Ayutthaya in terms of reputation or column inches in tourist guides, it is equally majestic and provides a tantilising glimpse in to Chiang Mai's past. There are over 20 sites, some of which have yet to be fully excavated and restored. Visitors can chose to view a selection of the ancient ruins either by tram or by horse and carriage, which was the option we chose. I felt sorry for the horse because riding in the carriage was my girlfriend and I, her father and 3 of our dogs!!! Wiang Kum Kam was founded in the 13th Century and briefly served as the capital of the Northern Lanna kingdom until severe flooding caused the inhabitants to move to the current site of Chiang Mai city. The palaces and temples were lost to history under a sea of mud and many later historians even doubted the existance of the city due to a lack of evidence. It became a subject of hot debate, myth and rumour, just like other so-called lost cities. The first remnants of Wiang Kum Kam were unearthed in 1984. Local residents who were clearing land and digging foundations for new houses discovered votive tablets, pottery and other treasures. Archeologists dated the finds to approximately 700 years ago which put it in the right time frame to be the city of Wiang Kum Kam. Further excavations by the Thai government's Fine Arts department finally confirmed the existance of the city, allowing it to take it's rightful place in the history books. If you would like to know more about Wiang Kum Kam then the following websites provide lots of useful information. I am off to Penang in Malaysia for a few days later today and will let you know how my trip went when I get back!! !